By Winifred Wilkinson HausmannLove is the most universally recognized and most frequently misinterpreted of the Twelve Powers. It is a part of life and living, and without love, people perish. 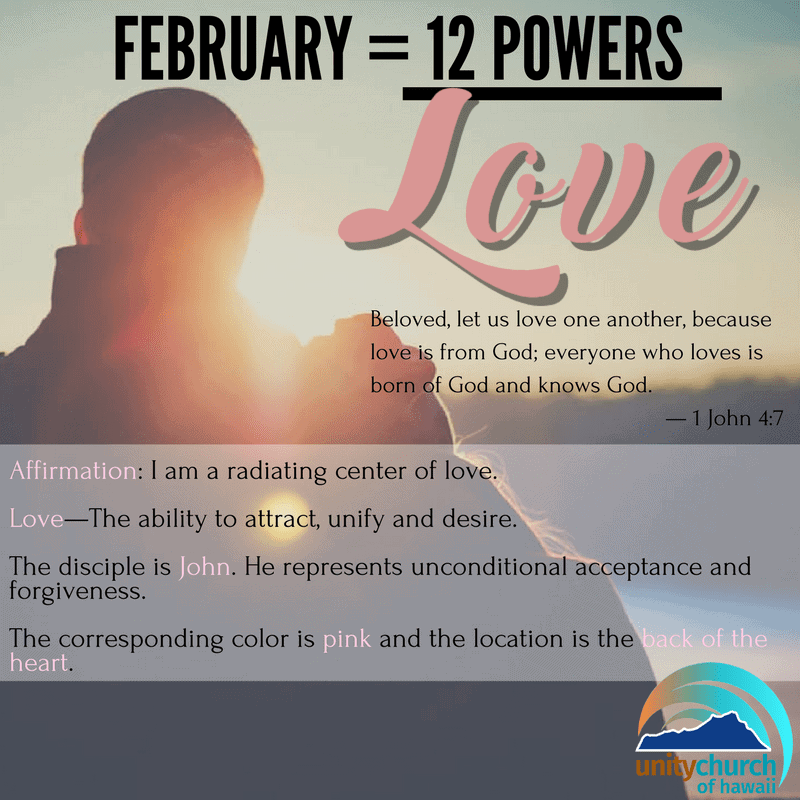 …When Jesus prayed the prayer of atonement with his disciples, as reported so beautifully by John (the love disciple), he was calling attention to the ultimate activity of love, the spiritual oneness that pervades everything in the universe. The love center in the body is in the heart. As the heart circulates life-giving blood throughout the body, so a right concept of love circulates life-giving sustenance through our thinking-feeling nature, as well as through our body and affairs. Development of the God-consciousness of oneness enriches all phases of the life it enters. The faculties of love, centered in the heart, and wisdom, from its seat at the pit of the stomach, meet in the solar plexus, at the back of the heart and stomach. In considering the unfoldment of [love], we must make sure that we link it always with wisdom. … Wisdom and love are not only two of the twelve [powers], but they are also the two phases of God that combine to produce creative activity of any kind. Christ in me quickens the disciple-faculty of faith. I have faith in God so that when I say to a mountainous challenge, “Be thou removed!” I do not doubt in my heart, and that which I say is done. Christ in me quickens the disciple-faculty of strength in me. I am strong in the Lord and in the power of his might! Christ in me quickens the disciple-faculty of wisdom in me. I am in tune with the infinite wisdom of universal mind. Now remember that love and wisdom go together as powerhouse sons of thunder. Gratefully acknowledge that they are quickened in you.